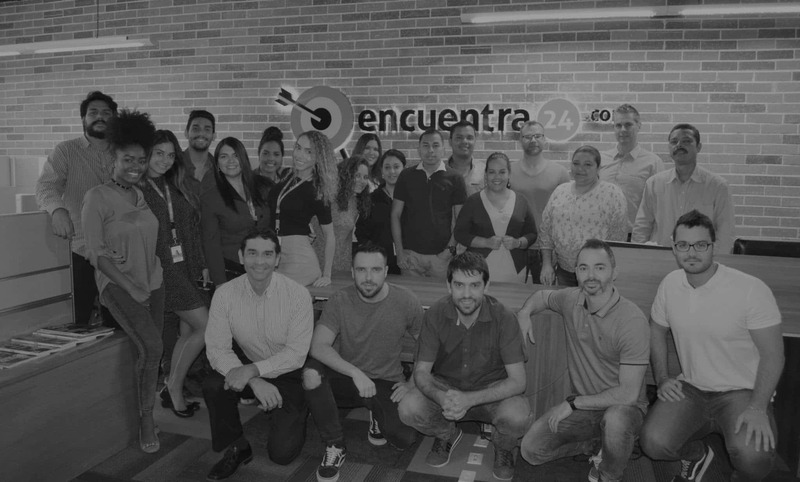 The team of Encuentra24 and Cuatroochenta’s technicians, at the company’s headquarters in Panama. Encuentra24 has climbed up a step further as the leader portal for Classifieds in Central America. With presence in 8 countries, renewed app functionality and design, 1.5 million downloads and a number of technical improvements in the pipeline based on machine learning, artificial intelligence and chatbots, with Cuatroochenta’s support, Encuentra24 is further consolidating as a project of international reference. After successfully transferring its extensive community from the web channel to a native appsince 2014 (with Cuatroochenta since 2016), the Encuentra24 app has consolidated its positioning during 2017, with over 1,200,000 Android and close to 300,000 iOS downloads, for a total of 250,000 active users, complemented with 7.5 million monthly page views on the web portal.And, most importantly, with the trust of people of all profiles who confirm that, as its motto puts it, “If you publish it, you sell it!” in Panama, Costa Rica, Nicaragua, Honduras, El Salvador, Colombia, Puerto Rico and Dominican Republic. Over 10,000 evaluations registered in Google Play –three quarters of them with the highest score (5)- prove such trust. But above all, the thousands of ads for vehicles, homes, offices, appliances, sports equipment, all kinds of services and even job offers, published and then deleted, when buyers are found, on a daily basis. Access is free and there are no in-app transactions, although users have the option to pay for better ad visibility. Partnerships for specific campaigns with major brands such as Movistar and Heineken-Baru Panama, or with chains of garages that certify the quality of the second hand vehicles offered, also make a major contribution to its solid reputation. One of the main keys to the success of Encuentra24 is the usability of the application, which is very intuitive and has a clean interface. 2018 has started with a new update to revamp its structure and design, making it still more powerful, usable and modern: more possibilities to edit and publish photos, more visible and dynamic advertising cards, improvements on searches, etc. And the main innovation: an in-app chat between users. At the technical level Encuentra24 is an international project, with the center of operations in Panama City, an office in Berne (Switzerland) and the Cuatroochenta app development team for Android and iOS in Castellón (Spain). After two years of fruitful cooperation, Cuatroochenta’s engineers Jon Lecertúa and Aitor Algorta have traveled to the classified portal’s headquarters in Calidonia, Panama Bay, in Janaury, to intensify cooperation and become more involved in the evolution of the tool. Encuentra24, with Wendy Jordan (COO) and Boris Métraux (CEO) on the frontline, and Cuatroochenta are already planning new features for the app, the web, the backend – managed so far from Switzerland – and for data management. The challenge now is to implement machine learning and big data algorithms to customize notifications, artificial intelligence for image recognition or bots to assist users on frequently asked questions. In short, keep improving the channel and continue growing together.